Wrap yourself into luxury with our full wrap around bedroom suite. 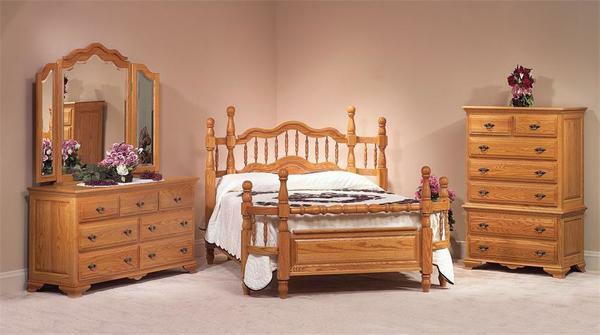 Crafted in solid North American Oak and finished in a high-quality stain, this gorgeous bedroom set is sure to make the perfect statement for any decor. Crafted with an early American style, each piece is authentic to the time period, featuring gorgeous raised panels throughout, ornate trim moulding on the top and bottom, and ornate feet that really bring to life this antique example. An Oak wood bedroom set is as classic as you can get and our Wrap Around Suite is sure to provide a lifetime a service with enough natural integrity to serve generations to come. King or Queen Wrap Around Bed - Wrap yourself into luxury with our full wrap around bed. Lay your head into a showcase of craftsmanship. From it’s intricate turned posts and rails to the flowing bends of the crown board, Wrap Around welcomes you home. Included are dovetailed mattress support slats constructed of poplar wood. Dimensions: Head Board Height: 56.5" Foot Board Height: 39.5"
Chest on Chest - This large solid hardwood, raised-panel, chest of drawers features 7 dovetailed drawers with full extension slides. Dimensions: Width: 38.5" Depth: 20.5" Height: 57.5"
62" Dresser with Beveled Tri-View Mirror - This solid hardwood, raised-panel, dresser features 7 dovetailed drawers with full extension drawer slides. Dresser Dimensions: Width: 62.5" Depth: 20.5" Height: 33"
Mirror Dimensions: Width: 59.5" Height: 46"
Optional Nightstands - A stunning companion piece to complement your bed and case pieces, each nightstand offers one deep drawer mounted with full-extension drawer glides, along with two doors that open to offer plenty of space for all of your nighttime essentials. Nightstand Dimensions: Width: 24.5" Height: 29.25" Depth: 20.75"